It’s hard to believe (or perhaps chilling depending on how comfortable you are with your age) that the Toy Story franchise has been around for 15 years now. The first ever feature-length CGI film, it is the only world to which Pixar has returned for sequels. With Andy [John Morris] grown up and leaving for college, his toys end up being accidentally donated to a day-care centre. At first the gang are overjoyed at the prospect of being played with again, but all is not as it seems. Meanwhile Woody [Tom Hanks], knowing Andy wasn’t ready to give them up, is determined to escape and return to his owner. The execution is near perfect, as we have come to expect, but much of Pixar’s magic comes from their creative originality too. And while they introduce a host of new interesting new toys, ultimately much of the story begins to feel like more of the same. Even the use of The Great Escape as inspiration seems slightly derivative of the claymation Chicken Run. 3D viewing is entirely unnecessary, yet it does not detract significantly from the film, although the typically vibrant hues are slightly washed out as a result. It is employed to minimal effect but is on par with similar animated fare. Arguably the chief benefit is the Day & Night short film at the start which features some incredibly creative merging of 2D and 3D elements in one of the best artistic uses of the technology in animation I have seen. While children will love the toy-based action throughout, much has been made of the more adult themes of abandonment and loss of childhood. The former is explored well through the reactions of various toys (and in an intriguing flashback sequence) but the latter is relegated to a powerful but brief sequence at the end of the film since the human characters are always sidelined in this franchise. Though the sequence is both heartwarming and moving, one feels more could have been made of this side of the story which holds far more interest for adult viewers. 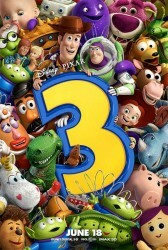 Toy Story 3 is a great finale and a fitting send-off to a group of well-loved characters. The return of nearly the entire cast (even John Morris as Andy) is an impressive gathering. Pixar are undoubtedly trading on nostalgia value here, arguably for the first time in their impressive history. Few would deny them that opportunity once, but it would be a shame for it to become a routine. Because, while Toy Story 3 succeeds through knowing its strengths rather than straining to differentiate itself, that doesn’t quite seem the Pixar way.